THE UNITED STATES has said that its surveillance programmes have gone too far in some cases – an unprecedented admission in its tense row with Europe over US spying against allies. After 10 days of scandal with key European allies, a statement late last night by Secretary of State John Kerry was the first to explicitly acknowledge overstepping by US intelligence. Kerry justified the surveillance in broad terms, citing the 9/11 attacks in the United States as well as attacks in London, Madrid and elsewhere to argue that the US and other countries have had to come together to fight “extremism in the world that is hell-bent and determined to try to kill people and blow people up and attack governments”. He said US intelligence has since 2001 averted attacks with intercepts of communications. But he acknowledged, without going into specifics, that at times it has been too much. Kerry also sought to give assurances that such steps, which have roiled close allies like Germany, would not be repeated. “I assure you, innocent people are not being abused in this process, but there’s an effort to try to gather information,” Kerry told a London conference via video link. And yes, in some cases, it has reached too far inappropriately. And the president, our president, is determined to try to clarify and make clear for people, and is now doing a thorough review in order that nobody will have the sense of abuse. Kerry added that what Washington was trying to do was, in a “random way,” find ways of determining if there were threats that needed responding to. “And in some cases, I acknowledge to you, as has the president, that some of these actions have reached too far, and we are going to make sure that does not happen in the future,” he said. Recent allegations and reports of widespread spying by the US National Security Agency have sparked a major rift in trans-Atlantic ties. A German intelligence delegation and a separate group of EU lawmakers were in the US capital on Wednesday to confront their American allies about the alleged bugging. Kerry’s remarks — released in a State Department transcript — came in response to a question addressed to both him and British Foreign Secretary William Hague about government surveillance. Kerry spent a good portion of his answer justifying the collection of data as necessary due to the threat of terrorism and suggested Washington was not alone in doing so. “Many, many, many parts of the world have been subject to these terrorist attacks,” he said. And in response to them, the United States and others came together — others, I emphasise to you — and realised that we’re dealing in a new world where people are willing to blow themselves up. We have actually prevented airplanes from going down, buildings from being blown up, and people from being assassinated because we’ve been able to learn ahead of time of the plans. Kerry also lashed out at some of the reporting about alleged spying, sparked by leaks from fugitive former NSA contractor Edward Snowden, wanted by Washington on espionage charges. “Just the other day… there was news in the papers of 70 million people being listened to. No, they weren’t. It didn’t happen,” Kerry said. There’s an enormous amount of exaggeration in this reporting from some reporters out there. US intelligence chiefs have said these reports are based on a misinterpretation of an NSA slide leaked to the media by Snowden. Rather than siphoning off the records of tens of millions of calls in Europe, as the slide seems to suggest, they argue that the data was in many cases gathered and shared by European agencies. Still, fresh US spy allegations keep cropping around the world on a near daily basis. Indonesia summoned the Australian ambassador in Jakarta Friday over a “totally unacceptable” report that his embassy was among diplomatic posts in Asia being used in a vast American surveillance operation. The Sydney Morning Herald newspaper, amplifying an earlier report by the German magazine Der Spiegel, said earlier this week that a top-secret map leaked by Snowden showed 90 US surveillance facilities at diplomatic missions worldwide. The paper also reported that Australian embassies in Asia were being used as part of the US-led spying network. On Wednesday, meanwhile, a report in the Washington Post alleged that NSA technicians had tapped into Yahoo and Google data centers around the world, winning access to vast amounts of private data. The report said a program dubbed MUSCULAR, operated with the NSA’s British counterpart GCHQ, can intercept data directly from the fiber-optic cables used by the US Internet giants. 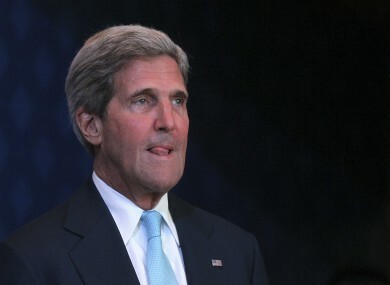 Email “John Kerry: Yes, US spying 'has reached too far' at times”. Feedback on “John Kerry: Yes, US spying 'has reached too far' at times”.